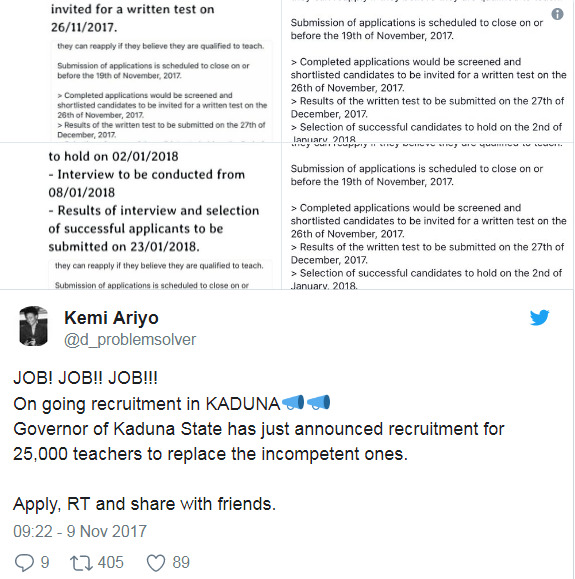 As controversy rages over the insistence of the Kaduna state government to sack over 20,000 teachers who recently failed the competency test, Nigerians have taken to various platforms, especially on Twitter, to share their thoughts. Following threats by the Kaduna State Chapter of the Nigerian Union of Teachers, NUT, to proceed on an indefinite strike from November 23, Governor Nasir El Rufai on Tuesday vowed to go ahead with the sack. “We have received a notice from the Nigeria Union of Teachers, Kaduna State wing demanding that we rescind our decision on unqualified teachers or else they (will) go on an indefinite strike. But then we ask, what’s the point of that strike?” the governor questioned. “To force us to violate our oath of office and retain unqualified teachers? 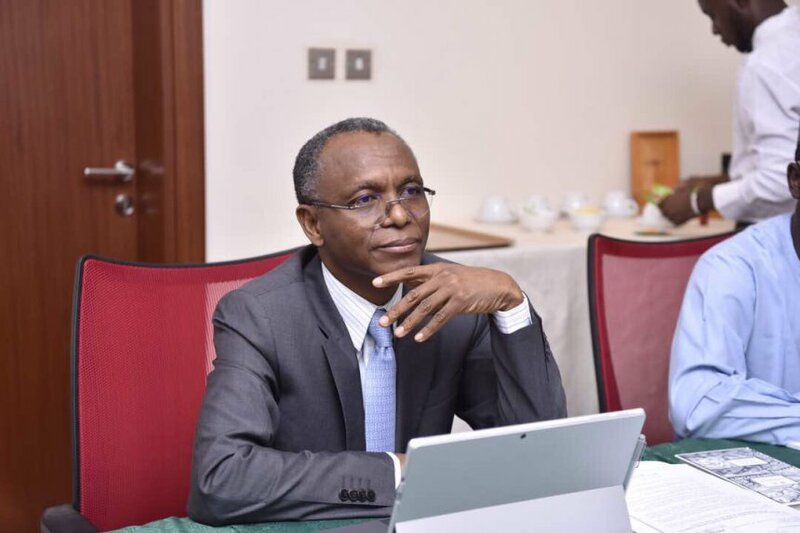 We have sworn by the Holy Books that we will only do justice and we are committed to ensuring that the children of the poor in Kaduna State must get free basic and quality education,” he said via a Facebook post. 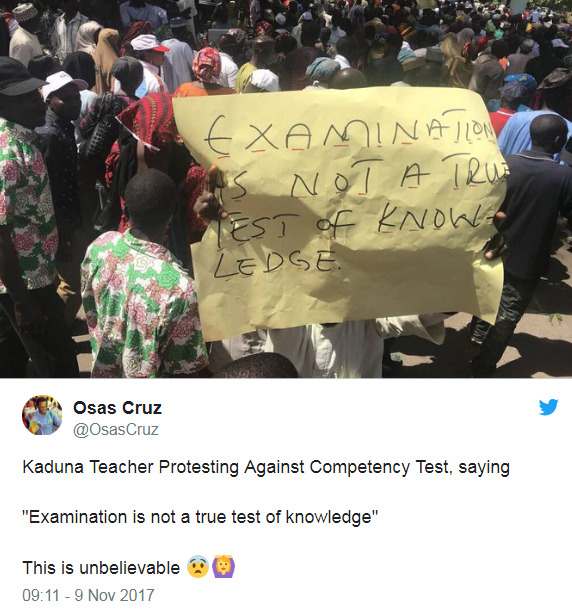 On Wednesday, the president of the Nigeria Labour Congress, Ayuba Wabba, led hundreds of demonstrators through the streets of Kaduna in protest against the planned sack. The development has caused widespread outpouring of opinions from people from all works of life. 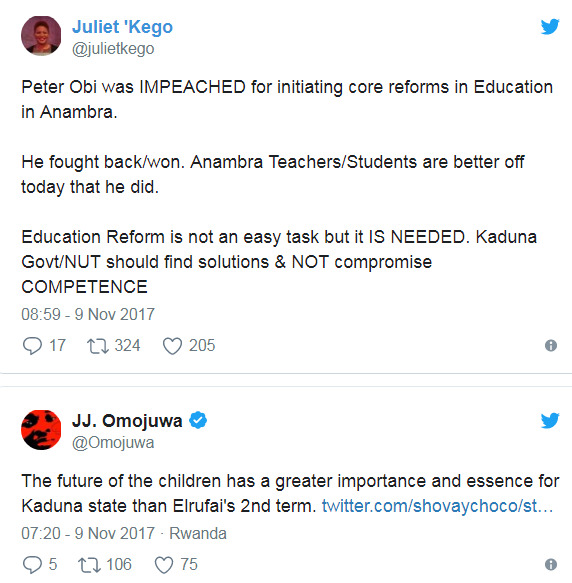 “Rather than sack the Kaduna teachers who failed the exams the state administered on them is it not better to train and retrain them? Why sack them and lose their years of experience?” Reno Omokri said in a tweet. A co-convener of the BringBackOurGirls campaign, Aisha Yesufu, also waded in on the matter. She took the perspective of teachers being compared to doctors to awaken the consciousness of her followers. “Would you allow unqualified doctors in hospitals because you think its “inhumane” to sack them? Unqualified teachers kill too. They kill the mind. A slow painless torturous one”.